A grow tent creates an ideal indoor growing environment by creating a grow chamber in the same way that a grow box does. Grow tents are comprised of a lightweight, six-sided fabric exterior installed over a rigid frame and includes a main opening and various apertures suitable for electrical access, ventilation and other functions. The U.S. 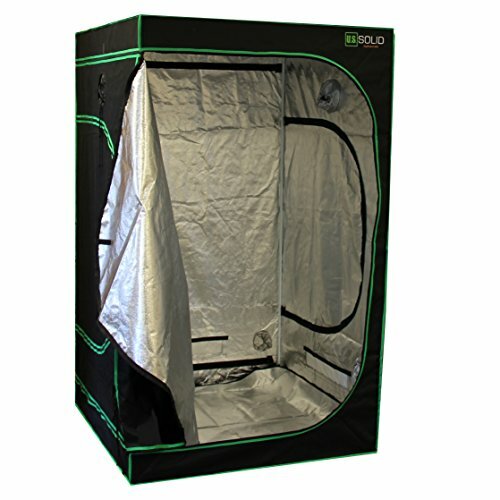 Solid 4x4 Grow Tent is designed to keep light out and keep odor and heat in. Its massive interior can easily hold a dozen plants. Our grow tent is made of the highest quality materials that you can find. The frame is made from strong metal poles that fit together perfectly to ensure that the tent is durable and structurally sound. We used a high strength fabric that is lined with a highly reflective Mylar to keep light out and strong odors in. The U.S. Solid 4x4 Grow Tent will provide the perfect growing environment for your plants which will allow you to yield a healthy crop.